Our mission is to study, document and publicize the value and conservation needs of horned lizards and to promote horned lizard conservation projects and assist with horned lizard management initiatives throughout their ranges. The Horned Lizard Conservation Society is a 501(c)3 non-profit organization dedicated to protecting horned lizards throughout North America. The HLCS was formed in 1990 by a group of concerned citizens in Austin, Texas. The HLCS has a Board of Directors that oversee the general operation of this organization and also has local contacts in Texas, Colorado, New Mexico, and Southern California. The HLCS offers grants for scientific research, education, and outreach events regarding information on and conservation of horned lizards. 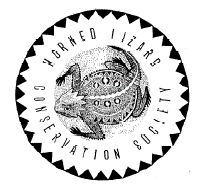 In addition to offering research grants, some of the HLCS's other activities include: educational displays at environmental and conservation events, organizing and leading horned lizard species surveys on both private (with permission) and public lands, community presentations, rescue, recovery and reintroduction of displaced specimens and creation and distribution of educational materials. The HLCS is entirely volunteer-based and all officers as well as members volunteer their time and resources to protect these animals and educate the public regarding the value of horned lizard species. If you would like to contribute to the efforts of the Horned Lizard Conservation Society, there are numerous ways to help. We welcome new faces and new ideas!